PORTSMOUTH, Va. – The Coast Guard Atlantic Area command held a ceremony to officially mark the Command Master Chief Change of the Watch in Portsmouth, Thursday. Master Chief Petty Officer Charles “Rob” Bushey relieved Master Chief Petty Officer Steven W. Cantrell as the Coast Guard Atlantic Area Command Master Chief. Presented the Legion of Merit Medal, Master Chief Petty Officer Steven W. Cantrell is congratulated by Coast Guard Atlantic Area Commander Vice Adm. Robert C. Parker during the Command Master Chief Change of the Watch ceremony May 15, 2014 in Portsmouth, Virginia. U.S. Coast Guard photo by Senior Chief Petty Officer Sarah B. Foster. Cantrell departs Portsmouth for Coast Guard Headquarters in Washington, D.C, where he will assume the Master Chief Petty Officer of the Coast Guard position May 22. 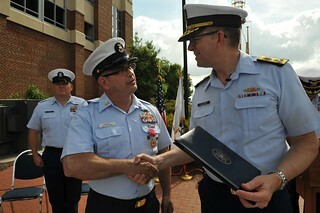 Vice Adm. Robert C. Parker, Atlantic Area Commander, presided over the Change of the Watch ceremony. The Change of the Watch ceremony is a military tradition that transfers the authority, responsibility and accountability from a departing senior enlisted leader to a new incoming senior enlisted leader. It represents a continuation of leadership and allegiance. The event allows an opportunity for the new senior enlisted leader to greet the staff while for the departing senior enlisted leader to bid his or her farewell. The CMC is the designated senior enlisted advisor to Coast Guard leadership. Playing an important role to improve the Coast Guard organization, he or she promotes balance between workforce needs and Coast Guard missions. CMC responsibilities include, consulting with commands and program managers on policies which affect enlisted members, upholding the highest standards of professionalism and stimulating communication at all levels of command throughout the Coast Guard. Headquartered in Portsmouth, the Coast Guard Atlantic Area encompasses Coast Guard missions from the Rocky Mountains to the Arabian Gulf, spanning across five Coast Guard districts and 40 states.